In this assignment, you’ll execute the needfinding plan that you outlined in Assignment M1. For the first needfinding plan that you outlined in Assignment M1, execute it and report the results. The type of information you report will depend on the approach you selected, but you should generally report the raw results. These might be the raw notes you took for something like naturalistic or participant observation; survey results if you performed a survey; interview quotes if you conducted interviews; and so on. You may provide long-form raw results in an appendix and focus on summarizing the results in the body of the assignment. Then, briefly summarize the takeaways from this particular plan. Last, report on the concretes steps you took to control for the biases you anticipated previously. In all these steps, remember that it is completely acceptable to fail. If your needfinding approach did not glean useful data, discuss why you believe that is the case. If you were unsuccessful in controlling for biases, discuss what you should have done differently. Repeat the steps for Needfinding Execution 1 for the second needfinding plan you outlined in Assignment M1. Remember to include the raw results, a brief summary of the main takeaways, and a report on the concrete steps you took to control for biases during needfinding. Repeat the steps for Needfinding Execution 1 and Needfinding Execution 2 for the third needfinding plan you outlined in Assignment M1. Remember to include the raw results, a brief summary of the main takeaways, and a report on the concrete steps you took to control for biases during needfinding. Based on the observations from your three needfinding exercises, complete your data inventory. 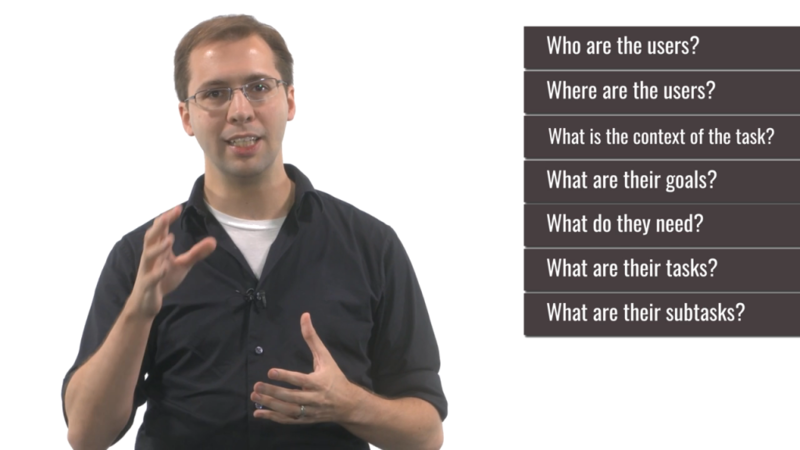 Answer the seven questions outlined with regard to needfinding (and remember, the video gives more detail on the questions than the image alone). For each question, specifically tie the answer to some of the observations you made throughout your needfinding exercises, and remember to keep your answers related to the problem space you defined previously. Remember again that you’re allowed to fail: if you did not gather the information necessary to answer a particular part of the data inventory, report what you should have done differently or what you would do next to answer it. Then, define the requirements drawn out of this data inventory, as described by the Defining the Requirements lecture. What are the requirements of your interface in terms of questions like functionalities it must provide, learnability goals it must meet, or accessibility standards it must support (as well as others)? What metrics or criteria would you use to evaluate the success of a prototype that attempts to address these requirements? Depending on your results and your project, you will likely emphasize some requirements over others; for example, if you are focusing on novice users, learnability will likely take a higher priority, whereas if you are focusing on experts, you may care more about efficiency. Finally, briefly outline the next iteration of needfinding in which you might engage based solely on this initial experience. What remaining questions are there that would benefit from additional needfinding investigation? What new questions arose during this initial round of needfinding? What types of exercises would you do next to address these remaining or new questions?